It's time for your Weekend Workout with our third writing challenge! Please do get in touch about both the functionality and content - what's good, what's bad, what could be better? Seriously, we love getting your feedback! Take a look at all the grammar you will cover: Weekend in Barcelona studylist. Note: As a Premium user you can retake these exercises via the link on the final scoring page. 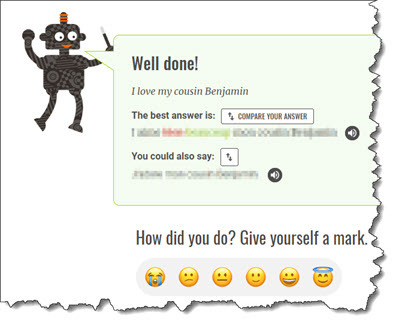 These tests are self-scoring, so after you translate or transcribe each phrase in turn, you'll be shown the correct Spanish to compare to yours so that you can give yourself a score. Please note that this feature is in BETA, so you may encounter the occasional bug or glitch. Please do let us know about these by responding to this email so that we can get them fixed asap. As always, screenshots and information about your system (OS and browser, including versions) are extremely helpful. We'd also love to know what you think about the new format and function: good, bad or indifferent.